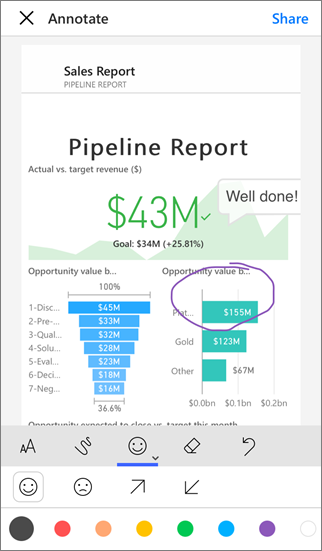 You can annotate and share a snapshot of a tile, report, or visual from the Power BI mobile app for iOS and Android devices. Your recipients see it exactly as it was when you sent the mail, plus a link. You can send snapshots of tiles to anyone — not just colleagues in the same email domain. You can add annotations — lines, text, or stamps — before you share it. 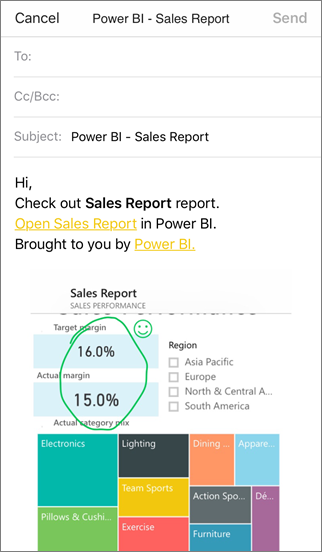 The mail with the snapshot of the tile, report, or visual also includes a link to the actual object on the Power BI service (https://powerbi.com). You recipients can click the link and go straight to that tile, report, or visual, if you and they have Power BI Pro licenses, or the content is in a Premium capacity, and you've already shared the item with them. You can share a tile from the Power BI mobile app for Windows 10 devices, too, but not annotate it. Tap the tile to open it in focus mode. Tap the annotate icon in the upper-right corner of the tile. You're ready to annotate and share the tile. Tap the annotate icon in the upper-right corner of the report. You're ready to annotate and share the report. In a report, tap a visual, then tap the expand icon to open it in focus mode. Tap the annotate icon in the upper-right corner of the visual. You're ready to annotate and share the visual. To draw lines of different colors and thicknesses, tap the squiggly-line icon, choose a width and color, and draw. To type comments, tap the AA, choose the text size and color, and type. To paste stamps (like emoticons) on the tile, tap the smiley face, choose a color, and tap where you want them. After annotating, tap Share in the upper-right corner. Open your mail app, type the recipients' names, and modify the message, if you want. The mail has an image, and a link to the specific tile, report, or visual.